While hearing loss in older dogs is not uncommon, it certainly does not mean every senior dog will go deaf, or even suffer partial hearing loss. If you do suspect your dog is having trouble hearing don’t panic, just keep reading. Would you be surprised to learn dogs are euthanised simply because they can’t hear well…or at all? So sad, especially because it does not have to detract from their quality of life or yours. When I refer to hearing loss that means partial or total, temporary or permanent. A simple check is to stand behind your dog and jingle your keys or clap really loudly. Do his ears move? Does he turn his head? How quickly/or slowly does he respond? If your dog has lost hearing in both ears you won’t get a response, but what if it’s only one ear/partial hearing loss? Try snapping your fingers close to each ear and watch for a reaction. While doing these tests make sure your dog can’t see you or feel vibrations or he may react because he knows or senses you’re there. 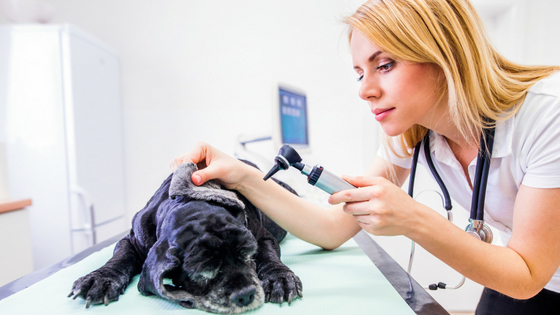 Now that you’ve determined your dog is experiencing some degree of hearing loss, your next step should be a visit to your vet. When booking the appointment I strongly advise you let them know the problem and convey a sense of urgency to get yourself seen as soon as possible. The longer it takes the worse the problem can become, and a reversible condition may no longer be. 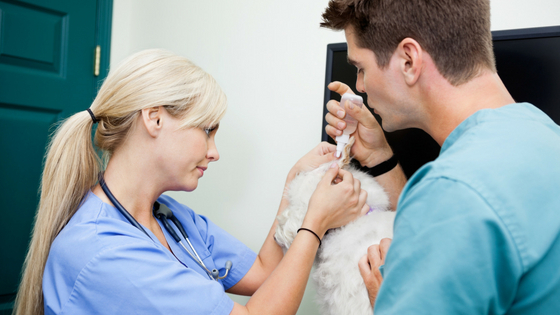 During your appointment your vet will ask you questions (and that’s when your list will come in handy), and then he’ll do a general checkup and of course examine your dog’s ears. Things he’d be looking for include – the state of the ear drum, buildup of wax, a foreign object, hair, inflammation… He may also take a swab or culture for testing. There is a test called Brainstem Auditory Evoked Response procedure (BAER) which measures the brain’s response to clicks directed into each ear. You would have to check with your vet to find out if he offers this test and how much it costs. Is the “dropping the keys behind the dog” test enough to determine he has a hearing problem, or do you need a more definitive test? Discuss the pros and cons with your vet, or do your own research to help you decide whether it’s beneficial or not. There’s not a lot you can do about age related hearing loss. However, regular vet checks to keep your dog’s ear canals clean and free from wax and hair build up are a good idea, especially if you have a dog with floppy ears. If you suspect he has an ear infection or any problems with his hearing, please see the vet right away. DO NOT assume it’s a natural part of aging and therefore nothing can be done. A dog who is deaf or has some hearing loss is first and foremost still a dog, with the same needs as any other. The best way is by using sign language, and you can either get tips through training videos for American Sign Language or come up with your own hand signals. Everyone living in your home and caring for your dog should learn them, and that includes dog walkers and pet sitters so there is always someone able to talk to your dog. Although Jack is not deaf, when I taught him to sit I always paired the word with a hand signal. I no longer use the verbal command only the hand signal, and should he ever lose his hearing I can still ask him what I want him to do. If your dog is already deaf, look out for a behaviour you like and reward it. If your dog happens to be sitting, use the hand signal you’ve chosen for “sit” then give him a treat, and do it each time he’s sitting. It shouldn’t take long for him to understand what you’re asking. Choose another signal for come etc… Make sure each one is different, clear and visible from a distance. If your dog is only partially deaf, talking louder will help. Okay that was obvious!! If your pup is playing in the garden at night, flicking the lights on and off will get his attention, and in the house you can use a small flashlight but never shine it in his eyes. Okay that last part was obvious too!! If you have kids running around the house or visitors dropping by don’t let them startle the dog, suggest the best way to approach. If you have pets then you know how important it is to keep hazardous materials out of reach, and to keep an eye on them when they’re out walking. A hearing dog can easily be told “leave it” or “drop it” and hopefully the danger or potential danger is averted/over. In the case of a deaf dog he has to be looking at you in order to see what you’re asking, so for safety sake you may have to go over and physically take the item away from him. You may feel very confident letting your dog off leash in an enclosed space, but what about an unenclosed area? That is a personal choice, and only you can make that decision. Let’s assume you’ve taught him a hand signal for “come” and he’s great at listening every single time. What happens if he’s not facing you and there is an oncoming danger such as a car that he does not see? I’m not saying not to let him off, just giving you something to think about. An alternative is to use a long training leash. While it won’t give him the same level of freedom as being off leash, he will have the chance to explore and do some wandering around. If you’re thinking of welcoming a deaf or partially deaf dog into your heart and home there’s only one thing I can say – congratulations and you’re amazing. Okay that was two things!! A deaf dog is as great a family addition as one who can hear, and there’s no reason they can’t fit into a home with children as well. The same criteria you would use for adopting a hearing dog is what you would use when adopting a deaf one. All dogs, hearing impaired or not need love, time, patience, training, socialisation, help building confidence and a happy home. It’s true training with hand signals is different than using verbal commands, but with practice and an awareness of how you use your hands around your dog you’ll get there. 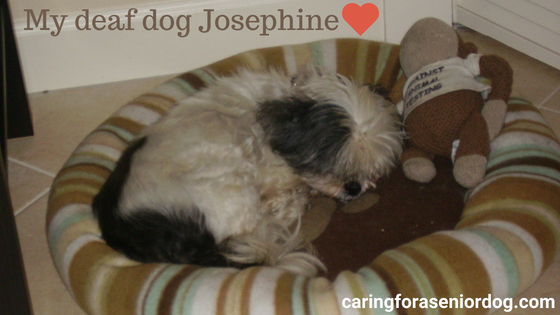 I know it’s a difficult time for you, but imagine how your dog is feeling? You can understand what’s going on, he doesn’t and may be feeling confused, scared, or nervous. Of course there will be challenges while everyone acclimates to what will be your new “normal” – but as long as you keeping loving him, showing compassion and patience you’ll all be fine. 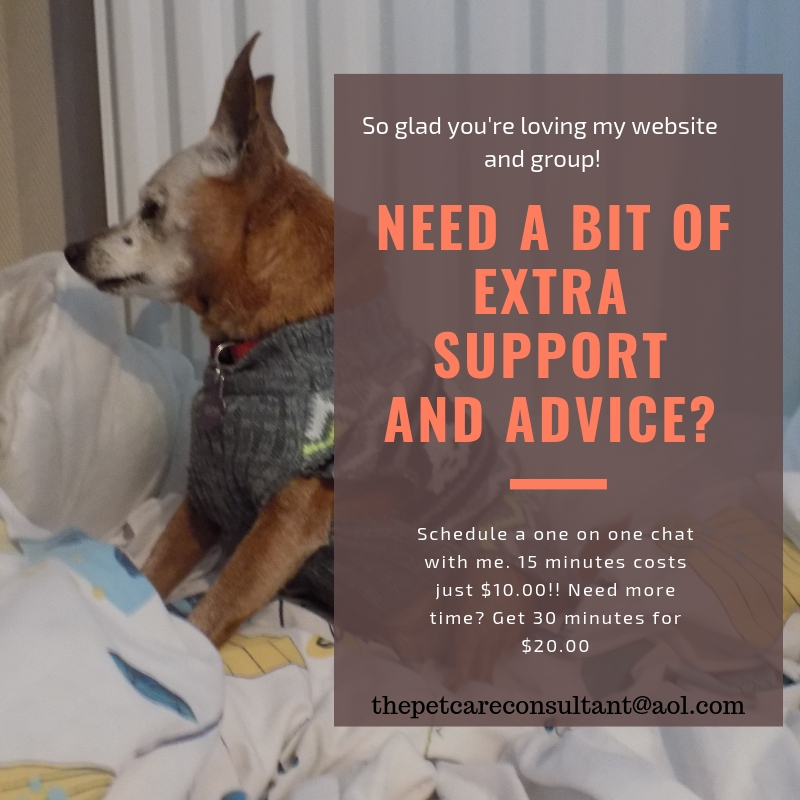 I hope this post on hearing loss in dogs has helped you see that life for and with a deaf dog can be just as wonderful as before, with a few “minor” adjustments. Did you adopt a deaf dog or did your dog lose his hearing? Do you know the reason? What adjustments have you made that helped? Sharing helps others so please leave a comment below. Thanks! I did not realize that dogs can lose their hearing too. I like the way you structured this post. I feel a lot of care from you caring for the well being of senior dogs. Hi Chase, I appreciate you taking the time to comment. It’s fair to say, many of the same illnesses and conditions that we’re vulnerable to, so are our dogs. It’s kind of you to say – I really do have a soft spot for senior dogs. My dream is to open a retirement home for animals! Hi Steve, Thanks for taking the time to comment. There are definitely some adjustments to make, but nothing major or difficult. If hearing loss is caused by an inflammation, surgery, for example, may help but it would depend on the extent of the disease, x-ray findings… As a matter of fact, there are hearing aids for dogs. From what I understand the University of Cincinnati is the only place that does it, but there are lots of issues – try getting a dog to wear one, and teach him to interpret sounds he’s hearing, not to mention the fact they cost thousands. Dogs adapt to loss of hearing, making their other senses even keener. Hi Sophie, My pleasure, I’m glad you enjoyed the post. Certainly makes sense why the idea of hearing aids for dogs hasn’t really taken off. Can you imagine? Hi Emily, Yes dogs can definitely experience hearing loss, and total deafness. Usually it’s just age related, but sometimes wax builds up and is left, or ear infections go untreated. It’s a good idea when training a dog, to teach him hand signals in addition to the verbal cues. That way if he does lose his hearing, you can still communicate. Thank you, I’m glad you found this post helpful. 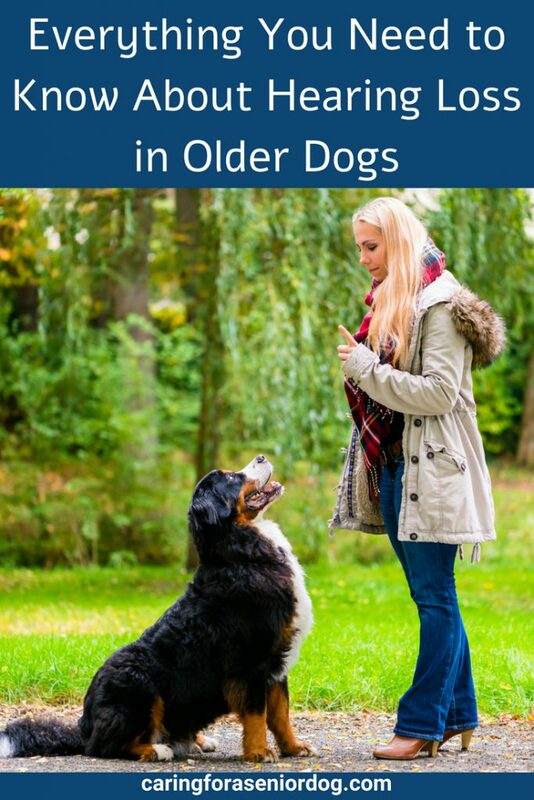 When dogs get older, people tend to assume everything that’s going on is just a normal sign of ageing, when in fact often our dogs are trying to tell us something, we’re just not paying attention. I certainly hope this helps. The deaf puppy in the video only had a few hours of play with a laser pointer. Thank you Christina, that article certainly is interesting. I know a couple of people with deaf dogs who use lasers but just to get their attention, and they haven’t experienced any problems. Something to keep in mind for sure.